The country’s longtime autocratic ruler President Omar al-Bashir was ousted in a military coup on Thursday. Since December, when the price of bread in the country tripled, thousands of anti-regime protesters have demonstrated in the capital city of Khartoum and across Sudan. Sudanese activists estimate that at least 50 people have been killed and more than 800 have been arrested since protests first broke out. “For the first time in 30 years, there was an actual feeling that we are pushing towards democracy in our country,” student organizer Sahar M. Omer ’20 said to the cheering crowd. General Awad Ibn Ouf, formerly the defense minister under al-Bashir, instituted himself as a replacement leader for a day before handing power to another general, Abdel-Fattah Burhan, on Friday. The protesters continue to call for a democratic government instead of a military regime. “The Sudanese students on campus — there are 14 of us, and I am so happy to call them my brothers and sisters from Sudan — have organized this protest to bring awareness to what is happening, but also to give support for the people in Sudan who are in the diaspora who are calling for a democracy,” Omer said. Sudanese students protest in support of democratic governance in Sudan on the steps of Memorial Church on Saturday afternoon. Days before, Omar al-Bashir, the dictator of thirty years, was ousted in a military coup. 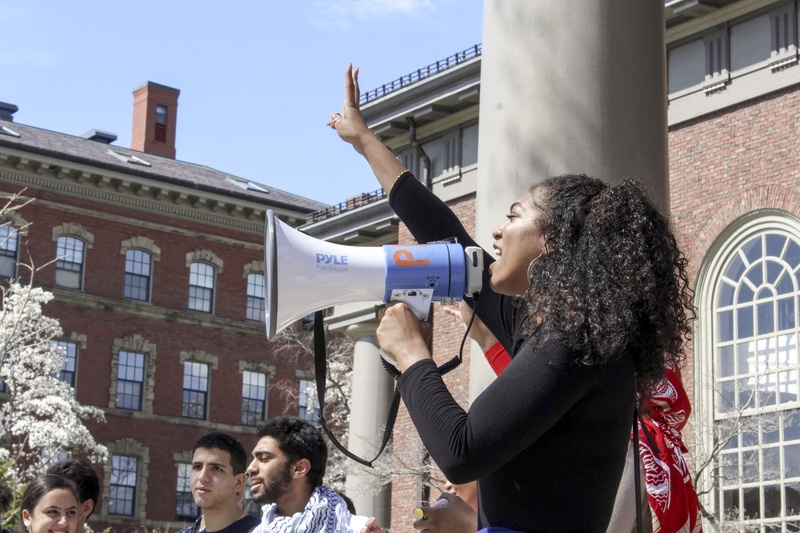 Ilham A.T. Ali ’21 led the crowd in chants, including “Kandake queens and we don’t fear you! We beat the British and we’ll beat you too!” as well as calls for the International Criminal Court to act against al-Bashir. Leena A. Hamad ’21, who attended the event and spoke to the crowd, also said she hoped the military regime will lose power. “The people of Sudan cannot go on like this. We cannot suffer 30 more years like this. The people of Sudan do not deserve another military regime,” she said, referring to al-Bashir’s reign since 1989. In a speech at the event, Ali spoke about the how the political unrest has affected her family. Ali also shared a story of a friend who was arrested and beaten by the police at age 18. Ahmad S.M. 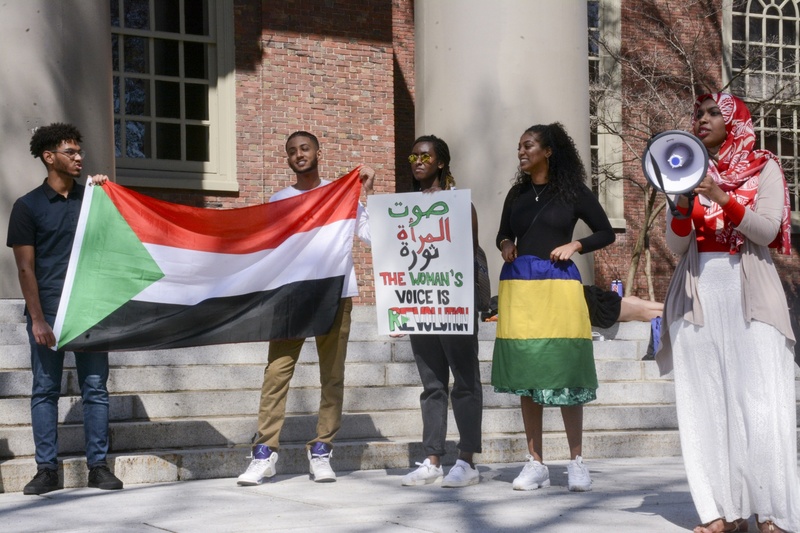 Saaid ’21, whose family also lives in Sudan, said the demonstration helped bring attention on campus to the ongoing plight. “The past few months have been difficult. And just having everyone here supporting us – me and other Sudanese students on campus — when we’re so far from home, so far removed from the cause, yet so in the middle of the cause at the same time, it’s truly amazing and it’s more than I could ever hope for,” he said. Mohamad Y. Khalifa — a Sudanese Arabic instructor in the African Language Program at Harvard — also spoke at the demonstration.